Before we dive into planning, though, I want to share a story with you. One of the most impactful professional learning experiences that I have ever experienced took place at the Central Texas Writing Project Summer Institute. One of the requirements was to deliver a model lesson to the group. There’s nothing more powerful than being in the seat of the student, and finding the gaps that may be missing in your lesson from their perspective. I learned so much about myself as a teacher, as well as some powerful strategies. Now, onto planning lessons! The outer, purple circle on the dynamic learning ring is the lesson planning cycle. It goes from purposeful planning through focused on learning outcomes, fearless implementation, facilitated with finesses, honest reflection, and share with the world. To illustrate these points, I’ll use model lesson plans from some amazing teachers to show how you can apply everything you’ve been learning in a real classroom setting! Tune into this final part of the five-episode opening series of this podcast to learn more about all these topics! I’ll also dig into best practices for writing lesson plans, the art of knowing how to switch gears, and other aspects of bringing dynamic learning into your fantastic new lesson plans! [00:28] - Let’s get started and plan lessons that will include everything you’ve learned to make your classroom more dynamic! [02:06] - Today’s shoutout goes to all the teachers from Franklin Park, Illinois, who participated in my Dynamic Learning Workshop a few weeks ago, even though it was on a Saturday. [03:29] - Kasey digs in to how to create meaningful dynamic learning experiences for students. [06:26] - We learn that today’s content is also available in Kasey’s book, Shake Up Learning: Practical Ideas to Move Learning from Static to Dynamic. [06:45] - Kasey revisits the idea of dynamic learning, and talks about some of the struggles of lesson planning. [09:26] - We hear a reminder of exactly what dynamic learning is. [12:35] - The first model lesson plan that Kasey will talk about today is from Christine Pinto, who uses Chromebooks every day with kindergarteners! [15:26] - Christine’s lesson definitely goes beyond the tool, Kasey points out. [15:41] - The next lesson comes from Sylvia Duckworth, who you may recognize from her fabulous sketchnotes for educators! [18:27] - Kasey explores what she calls the “mind-blowing unit” from Sean Fahey, Karly Moura, Michele Waggoner, Heather Marshall, Becky Ogbouma. This one hits all of the beyonds and all four C’s! [20:53] - Next up is #GoalTime from Matt Hawkins, which is a twist on Genius Hour. [22:31] - Today’s last model lesson comes from Carrie Baughcum, a special education teacher from Chicago, Illinois. [24:50] - Are the gears turning yet? Kasey hopes that these lesson plans have provided some inspiration for your own dynamic learning experience! [25:34] - If you’re not ready to write a full lesson plan yet, you’re in the pre-planning and brainstorming phase. Kasey’s Dynamic Learning Experience Planning Document should help! Kasey walks listeners through the six steps on this document. [30:04] - Once you know what your learning targets are, you can start taking steps toward creating a dynamic learning experience using an included template: either the DLE template (make a copy) or the ONE-PAGE template. [31:32] - Kasey explains the DLE template so that listeners can use it to its fullest. [33:41] - We hear some tips on facilitation and technology. [36:41] - The next two pieces of the implementation section are about differentiation and quality feedback, Kasey explains. [38:57] - We learn about how to figure out an assessment strategy. [41:20] - Kasey recaps this circle on the outer ring of the dynamic learning model, which she has covered through this episode. [42:27] - Kasey reminds listeners that this five-part series comes with an Epic Freebie Download! [43:35] - Here’s this episode’s question: what lesson plan would you like to revamp and plan as a dynamic learning experience? 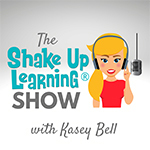 Kasey invites you to share the answer in the Shake Up Learning community, or on your favorite social platform using the #shakeuplearning hashtag. [44:15] - We learn about this week’s challenge: download the freebie bundle and share this episode with another teacher. Also come join the Shake Up Learning Book Study! [45:04] - This episode, Kasey’s resource is The Teacher’s Guide to Podcasts by Chris Nesi.